EDIT: That's all I have time to answer today. Thank you for some really great questions, and keep following my coverage at usatoday.com. Hey everyone! I’m a Miami-based reporter for USA TODAY, and I’ve been covering immigration for a decade now. The immigration world is a chaotic one right now, with President Trump cutting off $450 million in aid to Central America and threatening to close the southern border to slow down the record-breaking numbers of Central American families trying to cross into the U.S.
I’ve covered immigration from every angle and every perspective. I used to be based in Washington, D.C., so I learned how the issue plays in Congress and the White House. I’ve been all along the southern border, so I’ve seen that side of it. I’ve traveled throughout the U.S. to see how immigration affects all kinds of American communities. And I’ve reported from Mexico, Central America, and South America, so I have a sense of the root causes of migration. 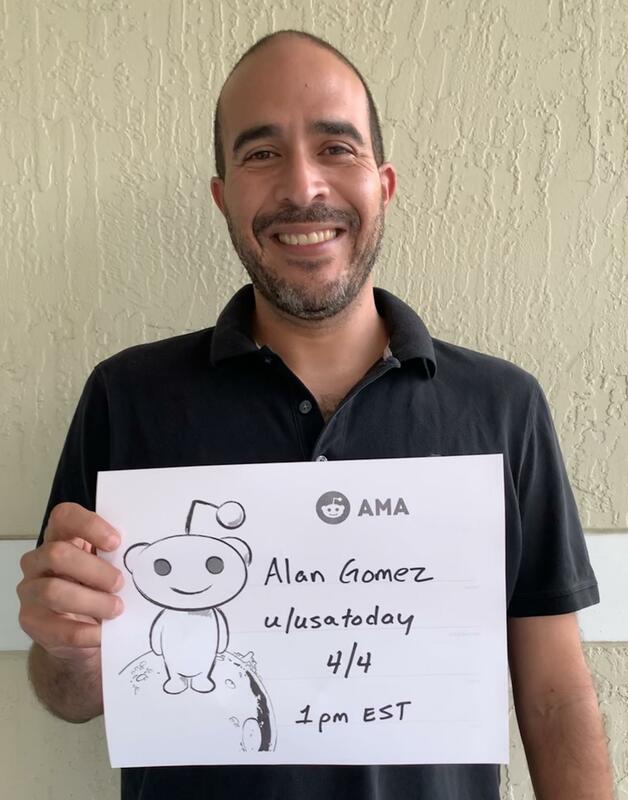 Ask me anything about my immigration reporting, and feel free to ask about any other stuff I’ve covered – Iraq, Afghanistan, Cuba, Guantanamo Bay, cops, courts, hurricanes, and suicide squirrels. Trump (again) threatens to seal U.S.-Mexico border. Can he do it? Ha. Figured that one would come up. Years ago, I was what we call a "general assignment" reporter, which means you cover anything that pops up, or any weird stuff you find on your own. I noticed that a bunch of massive power outages around the country were being blamed on squirrels, so I dug in and learned way too much about it. All those squirrels you see running along power lines? If they're just on the line, they're fine. But if they touch the line and a transformer (or the ground) at the same time, blammo! They're toast, and there's usually a massive power outage. Turns out power companies spend MILLIONS of dollars a year on what they refer to as "wildlife abatement technology." I could spend all day on this one, but there are many things that would need to happen at the same time for a proper update to our immigration laws to work. The core of our immigration laws is over 50 years old! So, to start, there needs to be improvements to our legal immigration system so that businesses can more quickly, and more fairly, bring in guest workers. That could be paired with a national worker verification program to ensure all workers are legal. That could be paired with real punishment for employers who hire undocumented workers. Implementing those three changes alone would go a long way, but a) they would be hard to pass through Congress, and b) they would only represent one part of what needs to change. We have to deal with the 11 million undocumented immigrants in this country, we have to update asylum laws to prevent what's happening at the southern border right now, and there are myriad other changes that are needed (DACA, TPS, DED, etc.). But I think the changes I mentioned would be a decent start. Great question. I'm a bit of a newspaper dinosaur in that I think my role is not to opine on the news or advocate for any side, but to present multiple sides of an issue and allow readers to make their own decision. Things have changed dramatically since I started out as a reporter, with more people pushing us to be "honest" about our positions or actively take a role to defend one side of an argument over the other. But I think (and hope) there's still enough space for reporters to simply provide the facts and let others do with that as they will. If crime and poverty are rampant in, let's say, El Salvador, many Salvadorans will flee the country and most will try to reach the U.S., as we're seeing right now. If crime and poverty were reduced significantly in El Salvador, the citizens of that country would be more inclined to stay there. Simple as that. The parts reporters are allowed to see are very similar to U.S. federal prisons. If they “behave” the inmates get some time outdoors (soccer and basketball, usually), they take art classes, read books, watch DVDs (last I was there, they were watching "Deadliest Catch," the Alaskan fisherman show). Of course, none of us knows what has happened over the years inside the interrogation cells, which there are plenty of. Hi Alan, thank you for taking the time to answer our questions and providing your expert insights. Can you outline the areas where there is enough consensus between Republicans and Democrats on the Hill when it comes to immigration reform? What would a compromise immigration bill roughly look like? Thanks again. There are many areas where there's bipartisan support. There's widespread agreement that the DACA population (undocumented immigrants who came to the country as children) should get permanent protections. There's widespread agreement that our guest worker visa categories are outdated, provide too few visas, and aren't responsive to the quickly-changing needs of U.S. businesses. There's general consensus that foreigners who study at U.S. universities in the STEM fields should be allowed to stay here and work (many are forced to leave and reapply to enter the U.S. in a separate visa category). There's general acknowledgement that E-Verify (the computerized, worker verification system that employers use to screen potential employees) is needed nationwide at some point. But when you start bundling all that together, it all falls apart because Democrats want to give the nation's 11 million undocumented immigrants a path to citizenship and most Republicans do not, labeling any such proposal "amnesty." All those areas of general agreement, but it all comes down to citizenship for the undocumented. What is the most heartbreaking thing you have seen as a reporter and how did it affect you psychologically? As reporters, we naturally create an emotional wall to insulate ourselves from the horrible things we see and experience. I learned a lot about that from cops and soldiers, who taught me how to compartmentalize trauma in your brain. I’m sure any psychiatrist reading this wants to punch their computer screen right now, but it’s how I learned to deal with it. And it works, sometimes. More often than not, it doesn’t. We’re all human and it takes a toll on you. The most heartbreaking thing I’ve seen is easily New Orleans after Katrina. I’ve seen a lot of horrible things in my career, and talked to far too many families who lost their loved ones, but Katrina was something different. Every day, interacting with people who’s lives had forever changed, seeing babies pulled off the roofs of their flooded homes, parents begging for water on the elevated highways…that was brutal.